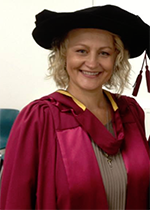 Ekaterina holds a PhD from Macquarie University, MBA from Charles Sturt University, Postgraduate Diploma in Economics, Business and Entrepreneurship from Stockholm School of Economics, Master of Arts and Bachelor of Arts from St. Petersburg State University. She has lectured and tutored at Macquarie University in the field of management since 2005. Ekaterina is a passionate educator with 10 years of experience in teaching including designing, delivering and convening Higher Education courses in management, leadership, organisational behaviour. She is a dedicated mentor and young talent coaching expert. Ekaterina specializes in qualitative research in workplace spirituality, ethics and leadership, and transformative learning in higher education. She provides transformative, substantiated, industry-relevant teaching by relying on her extensive and very successful corporate experience, networking capabilities and creative approach to teaching and learning. More, E., & Todarello, E. (2013). Business education and spirituality – The MBA with no greed. The Journal of Global Responsibility, 4(1), 15-30. Zhuravleva, E., & More, E. (2010). Spirituality in the mindsets of organisational members. Journal of Spirituality, Leadership and Management, 4(1), 19-33. Zhuravleva Todarello, E., & More, E. (2009). Concepts of spirituality within traditional management and organisation discourse. The International Journal of Interdisciplinary Social Sciences, 4(2), 143-159. Rooney, D., Todarello, E., Pauleen, D. and Küpers, W. (2016, 5 – 6 December, 2016), The temporal dimensions of wisdom development, Presented at the 6th Annual Australasian Business Ethics Network (ABEN) Symposium – Business Ethics Theory and Practice, Griffith University, Southbank, Brisbane. Bullerup, J., Todarello, E. & Pullen, A. (2015, 30 November – 2 December), Breakdown, Presented at the 6th Australasian Caucus of the Standing Conference on Organizational Symbolism, Anxiety and Organization, Sydney, Australia. Todarello, E. (2015, 1-3 July), Towards the more ethical understanding of a global mindset: A critique of the current global mindset research, Accepted for presenting at the EGOS conference, Athens, Greece. Todarello, E. & More, E. (2014, 1-4 August). Feasting eyes with Mona Lisa: A hermeneutic gaze at four unique faces of workplace spirituality. Paper presented at the Academy of Management Annual Meeting, Philadelphia, PA., USA. More, E. & Todarello, E. (2014, 3-6 June). Workplace spirituality in the context of sustainable leadership – New vistas? Paper submitted to the Institute for Sustainable Leadership (ISL), 9th International Symposium, Salzburg, Austria. Todarello, E. (2013, 16-19 May). The WOW of research: Introducing ‘the fifth element’ of authentic spiritual hermeneutic inquiry (AUSHI) - a research journey. Paper presented at The 3rd Management, Spirituality and Religion Conference, Lourdes, France. More, E., & Zhuravleva, E. (2012, 18-20 June). Business education and spirituality – The MBA with no greed. Paper presented at the 8th International Conference on Catholic Social Thought and Business Education, University of Dayton, Ohio, USA. Zhuravleva, E. (2011, 26-28 October). Accepting the challenge to develop the global mindset: Getting grounded in personal spirituality. Paper presented at the Academy of International Business, Southeast USA Chapter (AIB US-SE) Conference, Orlando, Florida, USA. Lim, C.-H., Zhuravleva, E., & Chavan, M. (2011, 13-15 September). Tripping over the culture talk in the structured selection interview process. Paper presented at the British Academy of Management, Birmingham, UK. Zhuravleva Todarello, E., & More, E. (2010, 11-14 February). Spirituality in the mindsets of organisational members. Paper presented at the Spirituality, Leadership and Management (SLaM) Conference, Baulkham Hills, New South Wales, Australia. Zhuravleva Todarello, E. (2009, 7-11 August). Managing the relationship between individuals and their organisations: A spiritual perspective. Paper presented at the Academy of Management Annual Meeting, Chicago, IL., USA. Zhuravleva Todarello, E., & More, E. (2009, 8-11 July). Concepts of spirituality within traditional management and organisation discourse. Paper presented at the Fourth International Conference on Interdisciplinary Social Sciences, Athens, Greece. Zhuravleva, E., & Jones, G. (2006, 11-16 August). Keep walking the road: Outgrowing our instrumental approach to workplace spirituality. Paper presented at the Academy of Management (AOM) Atlanta, GA., USA. Zhuravleva, E. & Jones, G. (2005, 7 – 10 December). In need for a more holistic perspective: Clarifying instrumental and non-instrumental approaches to workplace spirituality. Australian and New Zealand Academy of Management Conference (ANZAM), Canberra, ACT. Jarvis, W., Heizmann, H., Todarello, E., Morgan, A. & Hopely, E. (2014), "Cultivated "moral judgment" as a graduate attribute via Digital Story Telling (DST). What next? Can we learn from Gadamer?" Workshop delivered at the Australian and New Zealand Academy of Management (ANZAM), UTS, Sydney, Australia. Last Updated: 2018-01-31 10:30:54 by Ms Yang Yang.